Dulcie Pula Long is the daughter of well-respected national gallery artist Jeannie Petyarre. 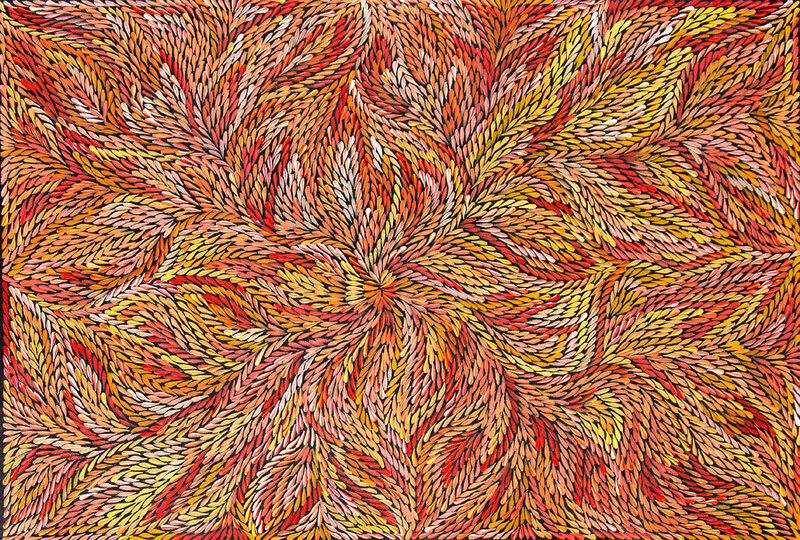 She paints the Bush Medicine Dreaming which is typical of her mother's work and of many other Utopian artists. This painting depicts leaves of a special plant that are used for medical purposes. Women go to different places around her country, Utopia, to collect such leaves.Once selected the leaves are boiled to extract resin and kangaroo fat is mixed through creating a paste that can be stored in the bush for extended periods. The medicine is used to heal cuts, bites, burns, rashes and also acts as an insect repellant.